In 1936, Middlebury chemistry professor John Haller spent three months grinding a 12.5 inch parabolic mirror which he donated to the College under the condition that an observatory be built on the knoll north of Pearsons Hall. A simple frame was soon constructed and the mirror was installed in a 10-foot-long Newtonian telescope under a dome built by Guatemalan amateur astronomer A. R. Ibarguen. Astronomy had been studied at Middlebury since the early 1800s when the Old Chapel cupola served as an observatory. Upon its completion in 1937, the new observatory hosted weekly meetings of an extra-curricular course called Romance of the Skies, which combined celestial observation with lectures on the history of astronomy and mythology of the constellations. This recently rediscovered 16mm film reel in the College archives shows unique interior and exterior shots of the observatory as well as students using sextants near Voter Hall. Despite these promising beginnings, by 1970 the observatory was little-used and had fallen into disrepair. Settling of the foundation made rotating the leaky dome difficult and wasps had built nests in the barrel of the telescope. But interest in astronomy was growing at Middlebury after the recent successes of NASA’s Apollo program and the building was refurbished. Professor Heller’s original mirror and other optical instruments had thankfully been safely stored away from colonizing wasps and were reinstalled. Although Middlebury’s octagonal dome on the hill was torn down to make way for the construction of McCardell Bicentennial Hall, a new observatory was built atop that same science center and has been serving stargazing students, faculty, and the public since 2001. Be sure to visit the Middlebury College Observatory during one of their Open House Nights this spring to get your own glimpse into the Romance of the Skies. “Prof. John Haller Builds Telescope and Observatory.” The Middlebury Campus, January 27, 1937. “Star Gazing.” Middlebury College News Letter, March 1, 1937. “Would You Try to Reach Jupiter with a Rig Like This?” Middlebury College Newsletter, Jul 1, 1971. This recently rediscovered clip from the 1930s in the College’s 16mm film archives shows the once-bustling Middlebury train station with students eagerly boarding a southbound train home for the holiday break. The footage also captures views of notable town architecture including the conical spire that once capped the Battell Block before it’s removal after a 1950 hurricane and the residence of George Harvey years before it became the Fire and Ice restaurant in 1974. As fall semester comes to a close, be sure to affix a Middlebury pennant onto your luggage, don your fur coat, and board the southbound train home for holidays! Langrock, Joann. Middebury Stores and Busineses. Middlebury: Henry Sheldon Museum of Vermont History, 2002. Thanksgiving Day meals are not complete without a perfectly cooked turkey. In these two clips from 16mm reels in the Middlebury College Archives, we see both students and the administration sharing in the enjoyment of Thanksgiving’s most iconic fowl. First, we join the College’s 10th President, Paul Dwight Moody, as he carves a turkey in the late 1930s or early 1940s. This event may have been part of any number of alumni turkey dinners that Moody attended over his presidential tenure. Next, we find a student in a 1950 promotional film for the College savoring a chef-prepared turkey meal. The clip goes on to highlight the focused work ethic and “enduring zest” for scientific experimentation exemplified by mid-century Middlebury’s “ambitious youth”. The 1947 Panthers were led by coach Walter “Duke” Nelson (far top left) through a comeback season to the state championship. 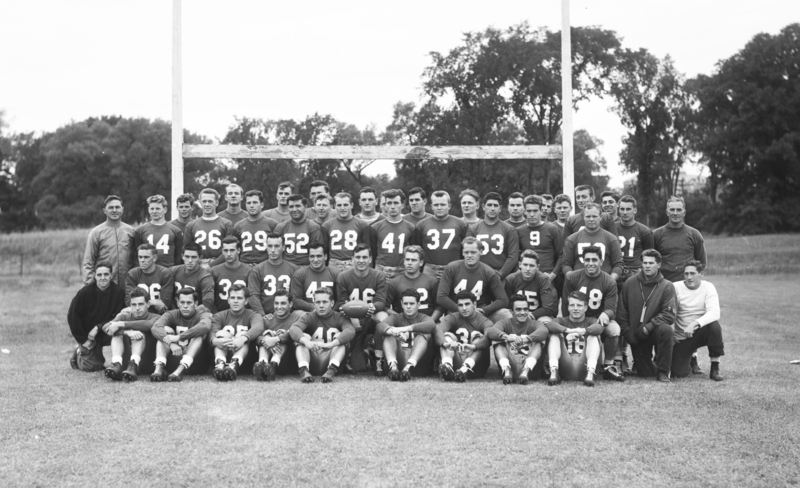 Though today’s Middlebury College football team stands as a formidable member of the NESCAC, the lineup that went on to win the 1947 state championships may not have seemed quite so promising at the start. Having consisted mostly of Navy men who could only practice after supper and on Saturday at the conclusion of WWII, the 1946 team had played a hard-fought four-game season with only one win. Thankfully, Class of 1932 alumnus Walter “Duke” Nelson returned to Middlebury to coach the program the following year and had a record enrollment of over 600 men to pick from. 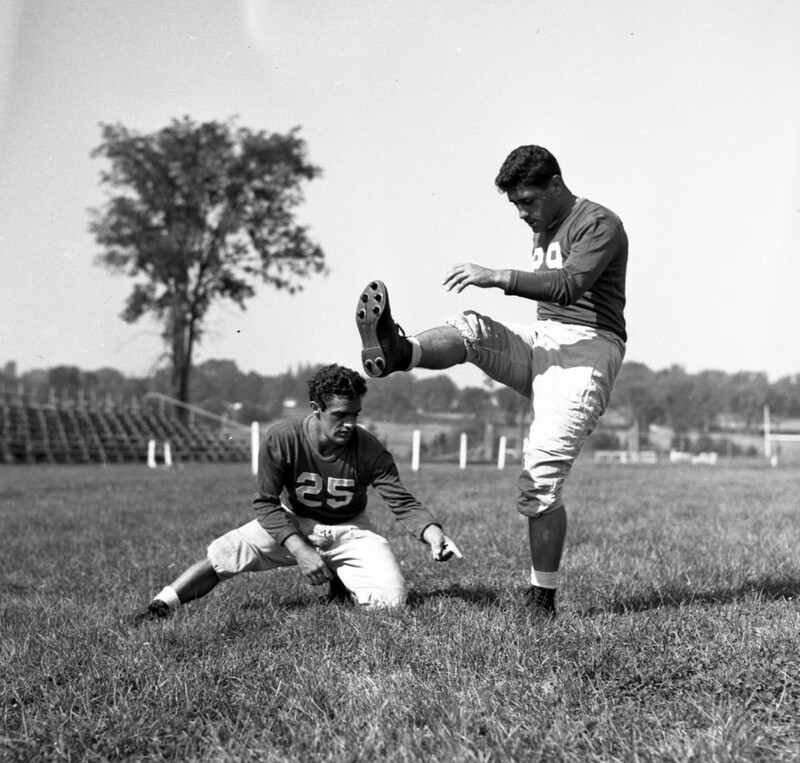 Two players from the 1947 lineup practice the skills that carried them through their historic season. This recently-uncovered clip from a 16mm film reel in the College Archives shows the inexperienced yet rising stars of the team at play as Coach Duke led them in their historic comeback. With footage from several home games (including one attended by Gov. Ernest W. Gibson), the clip captures the momentous nature of the season, thanks in part to dramatic cutaways capturing sports headlines that chronicled the team’s journey. When the capital of the Assyrian Empire was moved in the 9th century B.C.E. to what is now Nimrud, Iraq, a new palace for King Ashurnasirpal II was built and adorned with ornate alabaster reliefs. One such carving, which depicts a winged deity pollinating a date palm tree, became Middlebury’s first art acquisition when it was bequeathed to the college by alumnus Rev. Wilson A. Farnsworth in 1854. Rev. Farnsworth had been serving as a missionary in eastern Turkey when the archaeological exhumation of the old palace was taking place and managed to secure one of several unearthed slabs. 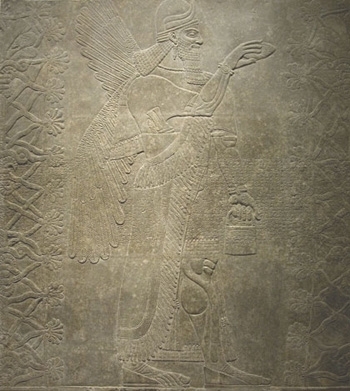 Now known as the “Winged Genie,” the carving contains a cuneiform inscription extolling the wonders of the king. Upon purchase, Rev. Farnsworth had it cut into sections that could be more easily transported on camelback to the coast. After a long sea voyage, the relief found its way onto a wall in the Library of the Department of Pedagogy in Old Chapel. 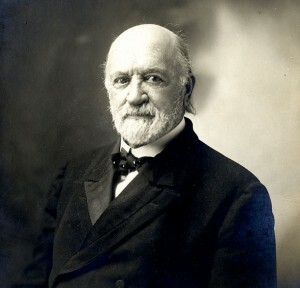 The “Winged Genie” slab was gifted to Middlebury College by Reverend Wilson A. Farnsworth, Class of 1848, seen here at age 87 in 1910. By 1936, a college newsletter lamented the lack of attention given to the artwork by students and alumni, adding that “occasionally some archaeologist who [had] never heard of Middlebury’s football team, its summer schools, its mountain campus or its academic rating [would arrive] to do obeisance” to the carving. Perhaps in a move to raise the relief’s profile, it was hung in the entryway of the newly-constructed Munroe Hall in 1941. As the following clip from the College’s 16mm film archive demonstrates, people were more than happy to become familiar with the carving. After gaining recognition from the college community and a fair amount of wear and tear, a campaign was launched in 1988 to raise funds for the cleaning and conservation of the slab. Complete with a new steel frame, the Winged Genie is now on permanent display in the Middlebury College Museum of Art where students and archaeologists alike can offer their obeisance. 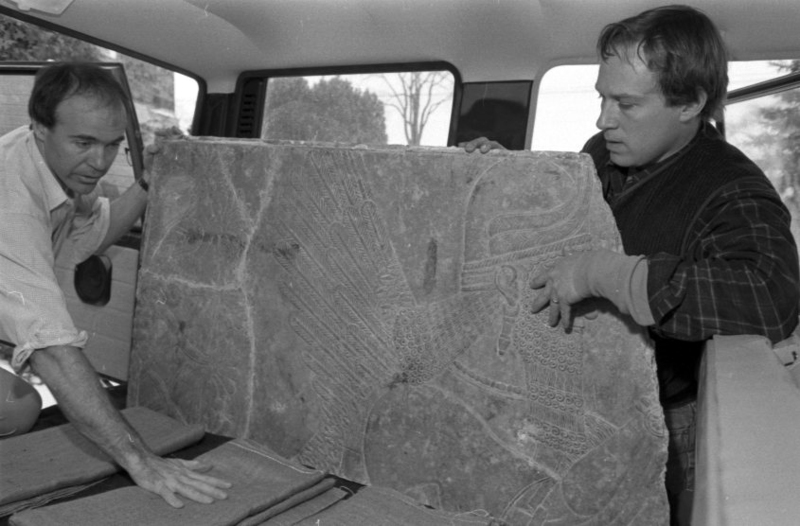 Twenty one segments of the slab are carefully removed from Munroe Hall by Museum staff Ken Pohlman and Harvard conservator Henry Lie for transport to the conservation lab at Harvard University. Photo by Eric Borg, February 1990. Be sure to attend the November 5th lecture, Ancient Near Eastern Art—in New England and in the News, to learn more about the legacy of Near Eastern Art in American museums from Prof. Susan Ackerman of the American Schools of Oriental Research and Prof. Shalom Goldman of the Middlebury Department of Religion. As spookiness begins to fill the cool Vermont air, ghoulish items lurking in the depths of Special Collections & Archives are coming out to join in the Halloween fun. Be sure to check back all week as we feature ghastly glimpses of the past in a series of posts leading up to the most frightening night of the year. The first in our series features a mechanical postcard illustrated by Ellen H. Clapsaddle (1865?-1934), an American artist born in New York state. 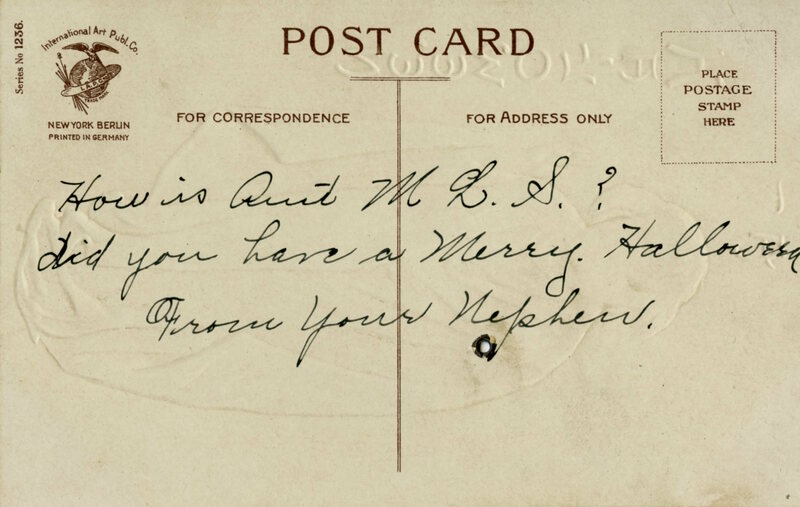 During the golden age of postcards in the early 20th century, holiday-themed greetings were all the rage and Clapsaddle became one of the genre’s most prolific artists. Close to 2,000 postcards have been attributed to Clapsaddle. This postcard boasts a movable, hinged arm that hopefully made up for the card’s belated arrival sometime after Halloween (scroll down to see the handwritten note on the back of the postcard). The front of this postcard from the early 1900s presents an embossed illustration by iconic card artist Ellen H. Clapsaddle, complete with an articulated arm. From C-132 Historic Postcards & Ephemera. 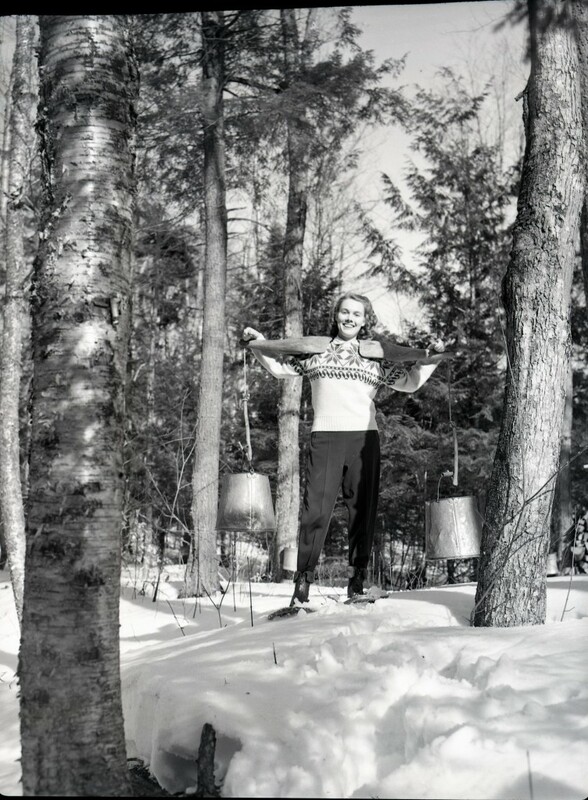 It’s early April and the maple sap is flowing, which means it’s time for one of Vermont’s most beloved traditions: The Sugaring-Off Party. This recently rediscovered clip from a 16mm film reel in the Middlebury College Archives records one such party held by students in the early 1940s. Sponsored by the Mountain Club, the annual outing brought sugar-craving undergrads to the college’s own maple grove near the Bread Loaf Inn. Complete with an evaporation hut for processing freshly-tapped sap into syrup, the “sugar camp” boasted 1,100 trees on land bequeathed to the college by Joseph Battell in 1915. Photographs from the 1939 party even made it onto the pages of LIFE Magazine. 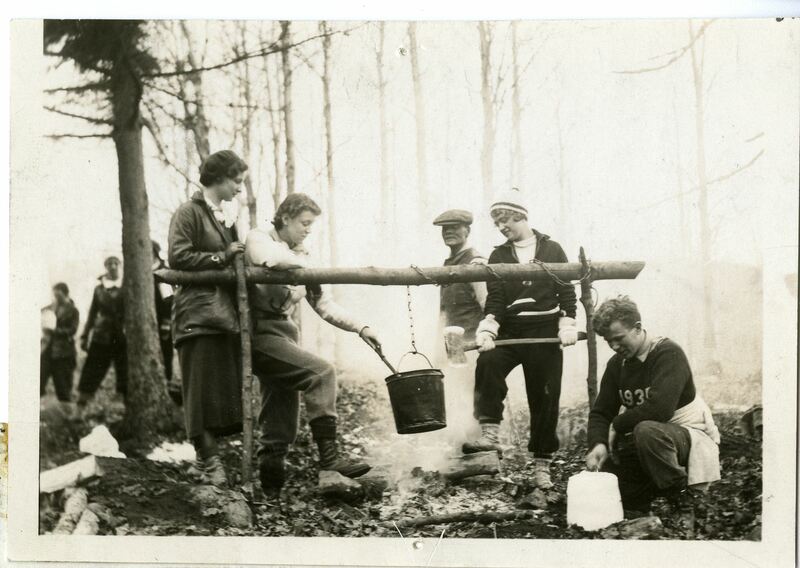 After hiking up to the orchard, “Sugarman” Boudreau helped the eager students collect sap and boil it to produce thick maple syrup. Like any good Vermont sugar-makers, the students diligently (and by no means begrudgingly) inspected the results by tasting generous helpings on snow with pickles and doughnuts. Others chose the more exhaustive measure of quality control and vigorously whipped the syrup until it hardened into maple candy.